Remember when I uploaded my recipe for the BEST Keto Fried Chicken that used whey protein powder to coat the chicken instead of almond, parmesan or pork rinds? Well, I just made an even better version that is DAIRY-FREE! 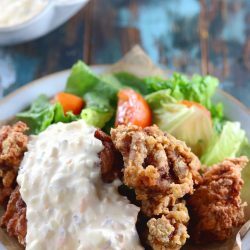 I’ve received multiple messages and requests in the last couple of months to see whether I could make a dairy-free recipe for fried chicken because whey can cause an insulin spike in some people. I tested a whole bunch of different flours and in my last test, the egg white protein powder had the best outcome. 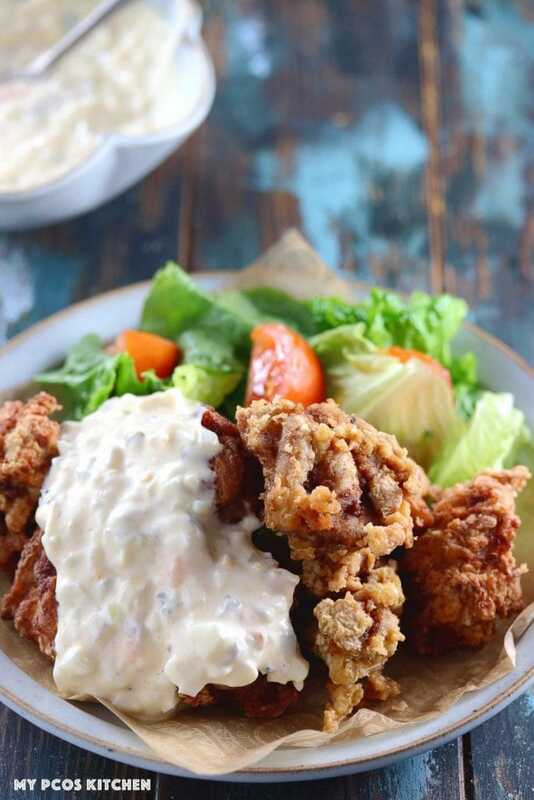 It came out as crispy as my other fried chicken recipe, the crust was flaky just like normal fried chicken and the seasoning that I added to this recipe was simply amazing! 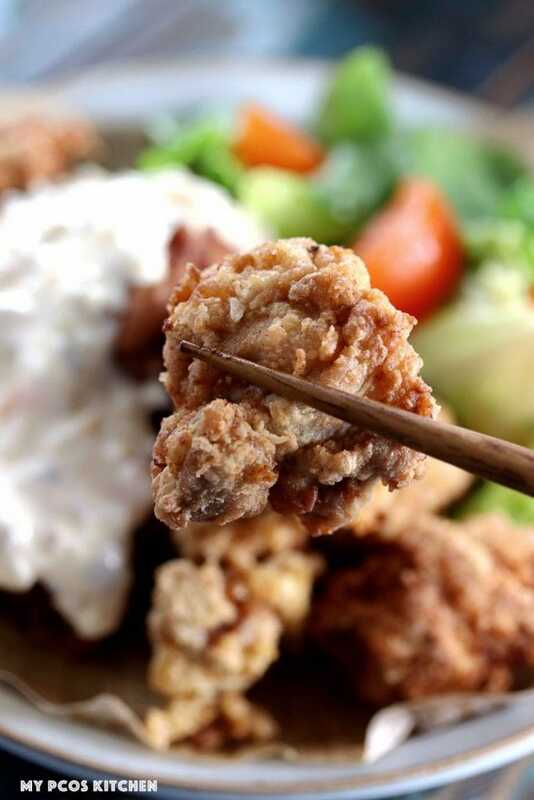 I made it taste like authentic Japanese Karaage, which is usually chicken marinated in ginger, garlic, soy sauce, sake and dashi that is coated in corn or potato starch and deep fried. 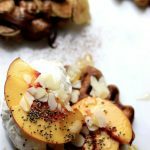 In order to make this recipe paleo-friendly, I left out the soy and sake, and used coconut aminos instead. For the batter, I used egg white protein powder from NOW. It doesn’t have anything else in the bottle, simply egg white powder. 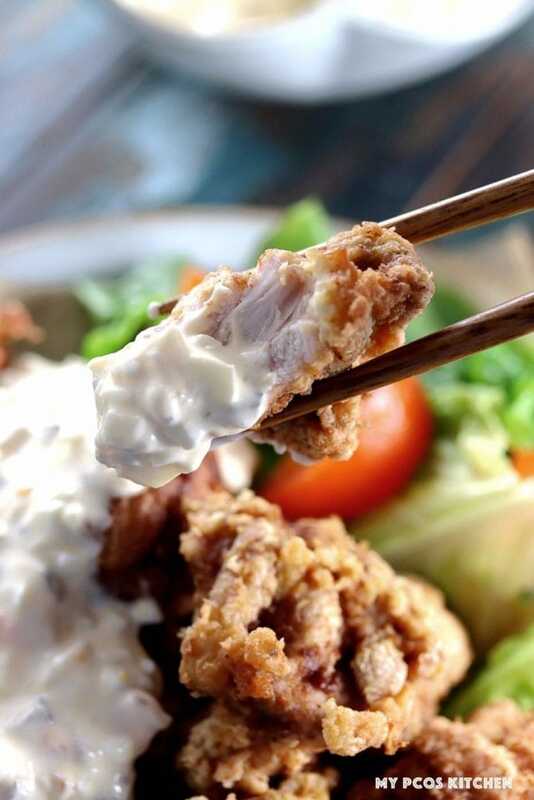 I decided to make it even more traditional by covering the fried chicken with a Japanese tartar sauce. 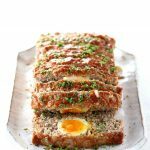 This sauce is dairy-free and consists of mayonnaise with some eggs and pickles among a few other ingredients. I used avocado oil mayonnaise from primal kitchen for this recipe. I deep fried the chicken in lard, as I always do, but you could always fry it in beef tallow or refined coconut oil. Because I marinated the chicken thighs before frying it, the meat was so flavourful, juicy and tender. 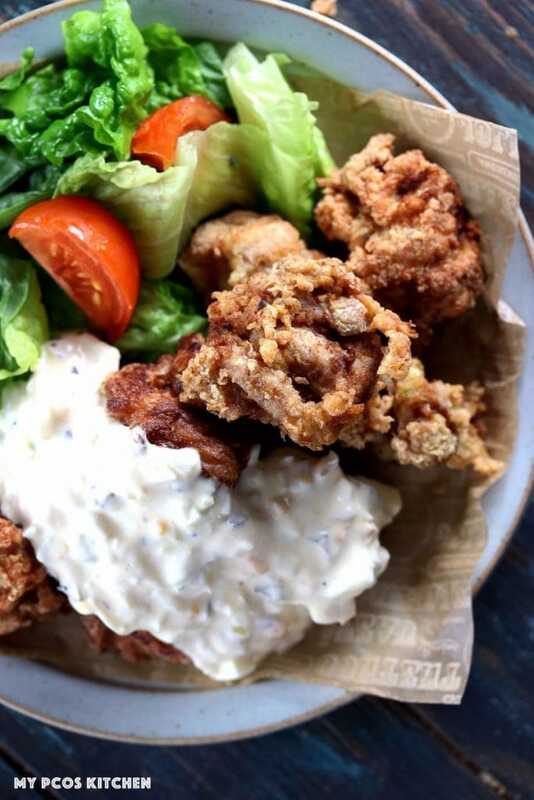 You couldn’t even tell this fried chicken was coated in eggs as the flavour of the marinade was all that you could taste! So don’t worry about it having an eggy taste, because it really didn’t!! It was just the BEST fried chicken ever! This is the egg white protein powder that I used! I’ve also made this recipe with chicken breasts and onions and it was absolutely delicious!! If meat isn’t an option for you, you’ll definitely want to try and deep fry some fish just like in my low carb fish tacos recipe! Grate the ginger, mince the garlic and cut the chicken thighs into bite size pieces. In a large bowl, add the chicken, ginger, garlic, coconut animos, 1 tsp of salt, 1 tsp of pepper, dashi, and eggs. Mix well together until all of the seasoning has coated all of the chicken thoroughly. Let marinade for 30 minutes or 1 day in the fridge. Mix the 1/2 tsp of salt and pepper with the egg white protein. Carefully remove the egg yolks from the egg whites. Take the egg whites and chop them finely with a knife. Mince the pickle. Mince the onion thinly and put in a little bowl of water for 2 minutes. Drain the water out. 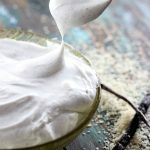 In a large bowl, combine the mayo, chopped egg whites and pickle, minced onion, lemon juice and stevia powder. With your hands, crumble the egg yolks and add it to the bowl. Mix everything together. 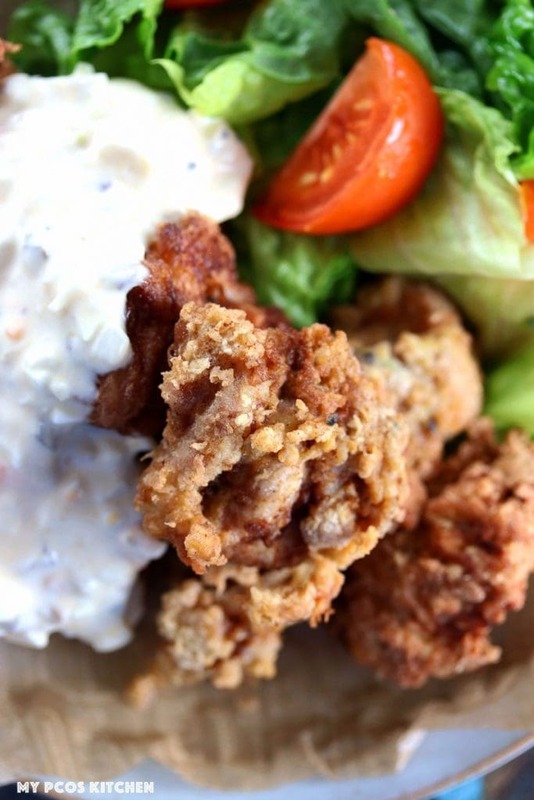 Spoon the tartar sauce over the fried chicken and ENJOY! *Before coating the chicken into the egg white protein powder, you MUST absolutely coat the raw chicken in eggs. The powder will NOT stick without the eggs. 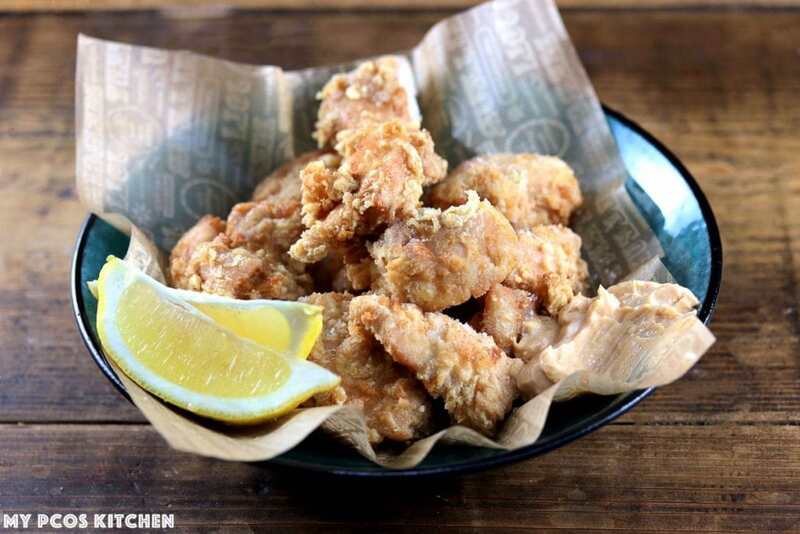 *You can flavour the chicken in any seasonings you want! Even plain salt and pepper is delicious. The nutritional info does not include the tartar sauce. Tartar Sauce - 4 servings. 1 serving = 338 calories, 35.2g fat, 1.6g net carbs, 2.89g protein. Hello, do you think this could be made in an air fryer instead of frying in oil? Air frying doesn’t really work. The batter gets really hard. You could try to spray oil all over and air fry but not sure how it would turn out. Hello! 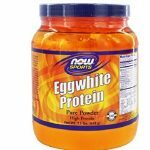 I was just wondering what the closest substitute for the egg white protein powder would be? It would be whey protein powder! Wow, so yummy. We all devoured it! Next time I need to make more!